Time is running out to save $200 on registration for the SFPE 2016 North America Conference & Expo in Denver, CO, September 25-30. Register today and save on this top-rated learning and networking event. Register today http://www.sfpe.org/?page=Denver2016. The fire sprinkler industry objectives are to promote, defend, enhance, and improve fire protection and part of that is to have people trained and educated. CASA can be the leader and resource for all of your training and education needs in Canada. No other organization in Canada provides as many education opportunities in as many subjects in various formats taught by experts in the industry. All seminar attendee’s will receive a free USB workbook, morning / afternoon coffee break. For more information and to view all of our Seminar Topics and Locations across Canada please visit our website at http://www.casa-firesprinkler.org/news-events/live-technical-seminars/ Please feel free to pass this information on to any of your colleagues who may be interested in attending the seminars. Registration is open for SFPE’s 11th Conference on Performance-Based Codes and Fire Safety Design Methods taking place in Warsaw, Poland 23-25 May 2016. Held biennially since 1996, this conference has an established global reputation as the premier international event for professionals involved in fire safety engineering, regulations development and enforcement, testing, standards of development and engineering design methods. The 11th Conference on Performance-Based Codes and Fire Safety Design will address newly emerging technologies and showcase the state of the art in performance-based code approaches and engineering design methods. Check out the fantastic lineup of technical presentations already scheduled for the conference, as well as the professional development seminars being offered on Thursday and Friday, 26-27 May. Topics for the seminars include Introduction to Fire Risk Assessment and Introduction to Industrial Fire Protection Engineering. The post-conference seminars offer an exceptional opportunity to optimize your educational experience and expand your knowledge base. Register today to take advantage of discount registration rates. Seneca College will be hosting a Career Fair and Industry Dinner on the 24th of March. See below. Seneca is proud to share this major event announcement regarding the Annual Career Fair and FPSA's Industry Dinner March 24th. On behalf of the Southern Ontario Chapter of the Society of Fire Protection Engineers, thank you to everyone that joined us to celebrate our 50th Anniversary on Thursday November 12, 2015! We celebrated this tremendous milestone with our membership and were lucky to host many memorable speakers and our first expert panel discussion. We are very grateful to our 18 event sponsors and to all of our volunteers that helped to make the day such a success. Our Chapter was also pleased to welcome Michael Madden from SFPE International Headquarters, who recognized our 50th Anniversary and also our recent Silver Chapter Excellence Award from SFPE International. Thank you to all of our supporters! 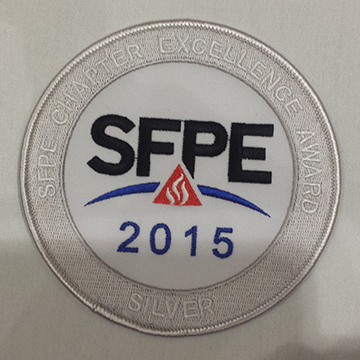 The Southern Ontario Chapter of SFPE has been awarded a SILVER Chapter Excellence Award by the SFPE Board of Directors. This is our second award as a Chapter. The award recognizes the efforts of our Executive Committee and the continued support and contributions from our membership and professional community. Thank you everyone for supporting our Chapter and helping us to serve you better! SFPE members are invited to attend a seminar series focused around some emerging issues in Fire and Life Safety in the Built Environment. The seminars, hosted by University of Waterloo Fire Safety Group and Sereca Consulting Inc., will take place from July 7th to 9th, 2015 at the Waterloo Region Emergency Services Training and Research Complex in Waterloo, ON. The Day 1 seminars will examine perspectives into the statistical analysis of fire losses, Day 2 will involve discussion of some implications of 6-storey wood frame construction and Day 3 will explore impacts of new requirements for integration testing of life safety systems. Live burns are also planned for each day. TORONTO, Ontario -- SFPE-SOC is very pleased to announce that we have awarded two recipients of the 2014/2015 Thomas Chiang Memorial Award. Ms. Kailee Houter and Mr. Richard Webster were both selected to receive an award of $500.00 in recognition of their efforts and achievements during the past academic year in the field of fire protection. These awards are made possible by the generous voluntary contributions of our Chapter members and is named in honour of Thomas Chiang, one of our former Chapter presidents and long-time SFPE International member, for his strong support for fire protection education. Congratulations to Kailee and Richard! 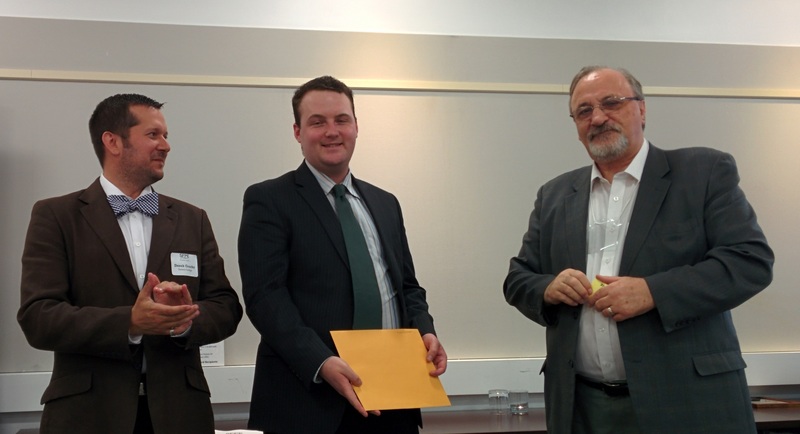 We were also pleased to recognize Mr. Matthiew Bonnin at our recent awards ceremony at our May AGM. 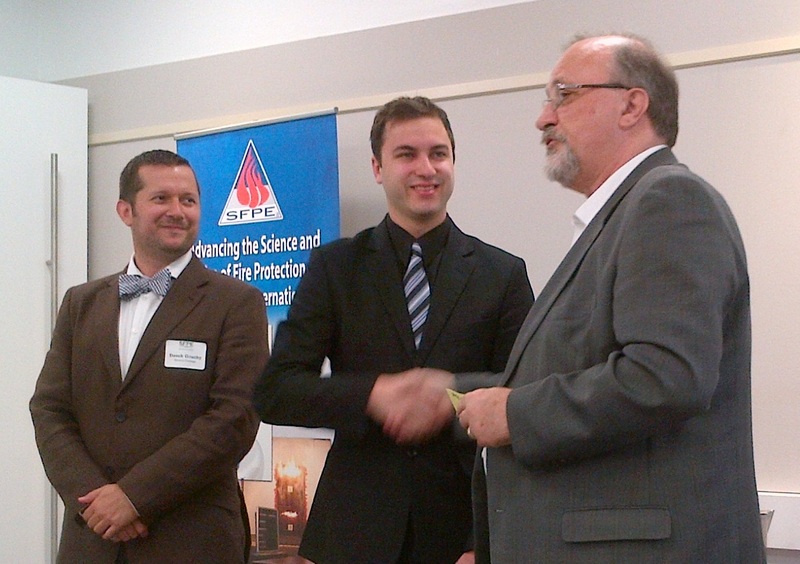 Matthiew is the winner of the Thomas Chiang Memorial SFPE Bursary distributed by Seneca College. Congratulations Matthiew! Thank you to all of our members and contributors towards our annual awards. 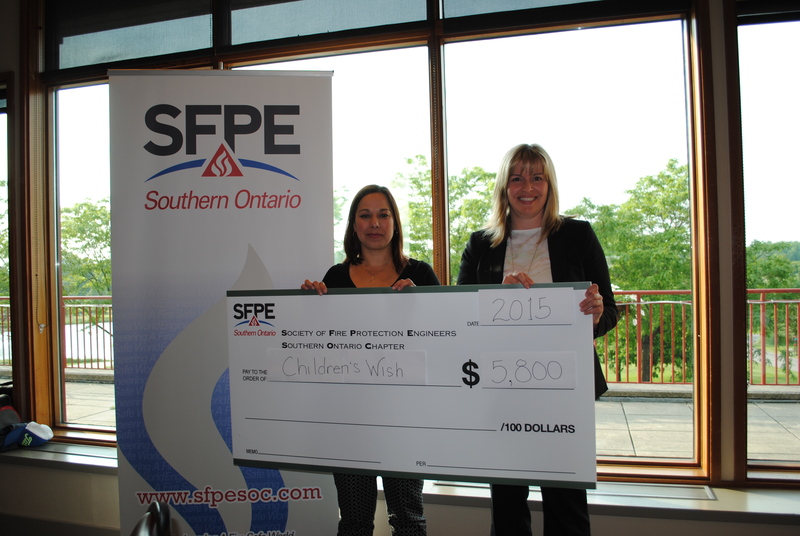 With your help, we are able to support the fire protection professionals of the future!